I finished my O'levels from South Breeze School and then did my A'levels from Mastermind. After that I went to Australia for further studies but came back due to some personal reasons and finished my A2 in private. 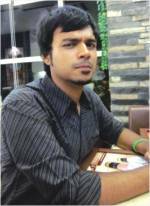 Currently I am in my 9th semester in Independent University, Bangladesh (IUB). I think I have spent the best days of my life in school. Getting admitted in South Breeze School was one of the best things itself. Playing for my school's football, cricket and basketball teams have gifted me with good memories from the school days but being the captain of South Breeze's Volleyball team and reaching the semi finals with an inexperienced team was a great moment. A sad memory would be when I was in third grade- I was not picked for the under-13 cricket tournament and I broke down, this was one of the worst memories. Another was in grade eight, while performing on stage I sang a line off scale and my own band mates thought I forgot the lyrics. On our last day in school just before O'levels we were all signing each other's school uniforms with wishes. I had three uniforms filled with wishes for me by my school buddies, juniors, seniors, staff, guards and of course, the teachers. I will never forget that day. My mentor was Chandan Miss; she literally taught me everything when I was a child. Badshah Sir, still the volleyball coach of South Breeze School inspired me to follow my passion and he does know how to bring out the best in a player. Our principal, with her charming smile and inspirational words, encouraged me through out my school life. But my biggest inspiration of all time has to be my father. He made sure I realise I had someone to rely on when there was no one else. School years should be the best days in a person's life. Make sure that you make the most of it, enjoy it and cherish it for the rest of your life. In school we used to be kids and were very carefree. But when in university we are older and responsibilities and problems pile up on us. Childhood friends made in school are the ones we make unconsciously and then we spend so many years together. No wonder they mean a lot to us even when they are so far away. University is more like a platform for me. We come here and start looking at the real world with a different perspective. Ideas start coming from all the corners of your head. And university helps to enhance those ideas and compile everything into one. I can not really claim that I am a proper musician but I am a great listener. I love and respect anything and everything that sounds good. Apart from the music scene I want to carry on working in the media sector. At the moment, I am looking forward to my graduation which is in a year and hoping for a good job after this. But working as a 'Kothabondhu' (Radio Jockey) is like a passion for me and would like to keep continuing this as long as possible. Lastly, for the young readers I would like to say, lead a carefree life and do not think too much cause it does not help. Take each day as it comes and do not think too far ahead, it is a distraction. Education should be the first priority but do follow your passion. Last but not the least dream big!